If you have any questions about the forums, how to do certain things, or if you have any feedback on what we could do to improve the forums, please let us know in this thread! The staff members or other knowledgeable members will answer your questions when they get a chance! Yes, please go ahead and post game threads! They all go into Progressing Projects, but we'll move them to the Project Showcase if they meet the requirements (which, if your game was already in the showcase, we'll probably move it ASAP). Just one thing has changed: the minimum number of screenshots has been changed from 5 to 6! Also if you wanna check out some of the new fancy formatting you can do, it's all listed here. I notice a little word counter at the bottom of the post box. Is there any persistence to this, like a word count high score board or would that be too easy for people to cheese by writing excessively long responses to random threads like I'm doing right now? It's the word count of your post, nothing more. Is there a required character count again? I have several quick questions. 1.) What does following a person do for you? Is it a way to get notifications for the content that the person submits, or is it a static way to show support for the person with no notifications involved? Or, is it something else altogether? 2.) What are the qualifications for the Streams tab, and how does a user post their stream for viewing there? I would like to include my stream up there if the tab is open for everyone. I'm unsure whether or not I would stream fan-game development content in the near future. At the very least, I would be streaming speedruns and maybe casual playthroughs for games. So if you're interested in keeping your experience a bit more private, there's options. You're pretty qualified just by being an active Relic member; you don't have to constantly stream fan game related content. Send your channel info (Mostly need the URL) to a staff member and we can add you to the list. the only issue I forsee is if you happen to have a very different username on the streaming site; we might ask for some kind of proof that it's actually your channel we're promoting. It works with Twitch and YouTube and a couple other sites too so if you stream on a couple platforms don't be afraid to mention it. We all had to make a new one for the new site. Just a suggestion for something we could have. I saw it on another forum that uses XenForo, maybe we could have a thing on the sidebar of the main page with a feed of recent status updates? That way they'd be more open than something you'd have to look for. I haven't found one I don't think we have one but would we/do we have a shoutbox? The shoutbox is basically Discord. So if I have a game-making related question, where do I post that? 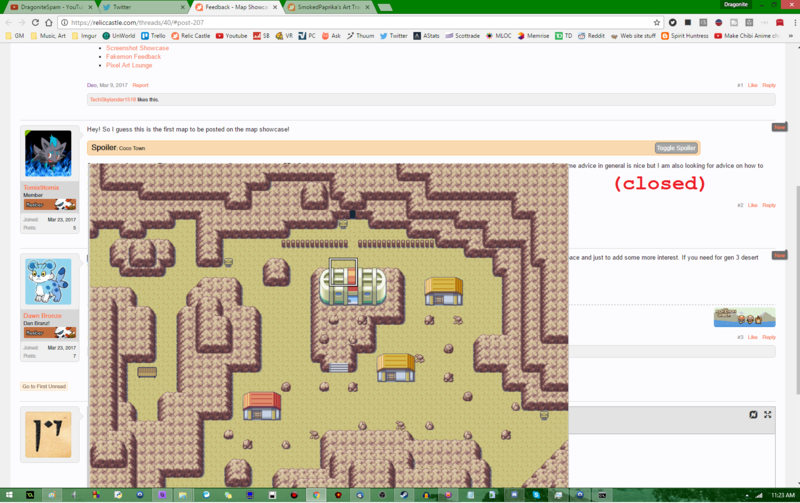 There's a Pokemon Essentials forum just for things such as that. Right under the fan-game discussion forum. I joined through Discord at first, but then decided to join the forum-specific Discord today. Every time I try to join I'm removed from the server. Signing up that way causes a weird bug with your Relic account. You're gonna need to un-link the Relic and Discord accounts, and then you'll probably have to make a new Relic password and re-link the accounts again. It should all work smoothly after that though! Hey, does anyone know how to add secret bases in your pokemon game.